Welcome to our unique and individual design project. 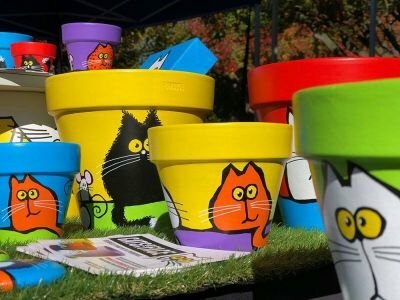 We've chosen to create a series of individually hand-painted terracotta planter pots, wooden and cardboard boxes, beach stones and canvas paintings all in a range of sizes, colours and designs, all decorated with our own original illustrations of CATS. If you are a 'cat-person' you'll know why we chose the name CATS IN YOUR FACE. You may already be smiling - which is exactly what we hoped for. We sell our products regularly at selected local markets around Christchurch. Just like our cats, creating these products has been a constant source of inspiration, amusement and great joy for us. We hope they bring the same for you.